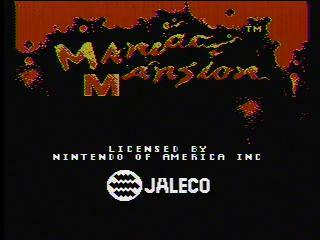 Released by Lucasfilm Games in 1987, Maniac Mansion puts you in control of the teenaged Dave Miller and two of his friends, as he ventures into the Maniac Mansion and attempts to rescue his girlfriend. This game revolutionised adventure games with its point-and-click interface and humour, and inspired a TV series. Best time: Single-segment 0:06:49 by Kyle 'Mr. K' Halversen on 2012-08-13. When I first came to SDA, I was shocked to see this game didn't have a run. I played this game a lot growing up as a kid and always loved it. I'd finished my Contra III low % run this summer and I picked this up again. ARC's TAS run blew my mind when I first watched it. I started practicing and found I could duplicate some of the tricks. As time progressed I found out that all of the tricks were possible in real time. After a lot of practice I've got this run to the point where I can feel satisfied with it. Arc- Your TAS of this game was incredible. You discovered the glitches that made this time possible. Planning a console run of this was tough and I ended up just stealing your route. Well, I didn't completely steal it, I made one minor improvement. In the proud tradition writing comments that are obscenely long, here you go. Character Select Screen- I always liked Razor and Bernard when I played this game as a kid. Bernard is...well Bernard. You can see his pocket protector as he walks. Besides, it's canon that he sneaks into the Mansion in the first game right? Razor is easy on the eyes. Seriously though, you get optimum cursor positioning after picking Razor and Bernard. It's just a fun coincidence that they're also my favorite motley crew. If you switch kids while on screen, you don't have to wait for the transition screen. If a kid is walking in a direction and you switch to a new kid, the first kid will continue walking. I quickly move all three characters over this way. I immediately send both Dave and Bernard up the stairs. I switch back to Bernard to correct his positioning so that he will get captured by Ed immeidately as he appears on the stairs. I switch back to Dave to get him up the rest of the stairs. The TAS has perfect positioning immediately, but has to wait a moment on the stairs and correcting positioning this way doesn't cost any time. Going right is a pain in this game. The screen doesn't start scrolling until after your character is almost completely over to the right. I wasn't able to get Dave to the side of the hall without stuttering a bit. You can't just mash the button because that causes lag. switch back to Dave immediately. After the switch, Dave can walk up the rest of the stairs and to the next room. Dave needs to use the hunk-o-matic machine once in order to be able to open the grate on the front porch and the garage door. I quickly use it and return to the Third Floor Hall. The way the screen moves makes it difficult to open the door. I stutter for a bit on purpose to make it easier. I love this room. It's the only room of the house that I've never lost a run in. I head back down the hall and into Weird Ed's room. I get captured quickly enough and switch back to Bernard. I instantly pick up the silver key and head out the basement. Going right is a pain and I don't do it nearly as well as the TAS. The lag is really pronounced here, I'm not sure how the TAS avoids it. I stutter for a bit to get the screen to scroll to the right before opening the water valve. I don't know why I was able to get out before the cutscene when the TAS didn't. I move Dave to the front porch and switch to Razor and steer her to the front door. I wait for a bit with Dave on purpose to give her more time to get closer to the door. I stutter on purpose as I move to the right. I want Edna to chase me. The screen needs to be pretty far to the right for that to happen. I switch to Razor and have her go inside. The cutscene where Purple Tentacle checks the basement is skipped and I immediately switch to Dave who promptly exits the kitchen. This is not an easy room. I can't pull off the optimization of the TAS. I hang for an extra moment on selecting the silver key from the inventory, but it's not too bad. See how much easier it is to go left than it is to go right? It's the same story with the kitchen, much, much easier. This is one of the harder parts of the run. I need Razor to push/pull the gargoyle head and Dave to get into the basement. I move Dave to the right, switch to Razor and have the push command ready as the screen is scrolling. I catch it without too much delay. This went pretty solid. Not much here, just going left till I hit the door. I can't time it like the TAS does so I do have to get the cursor all the way to the right side to switch to Bernard after telling Dave to go to the far left. for the inner door. The next trick is also pretty tough. I switch to Razor and have her ring the doorbell. I then switch back to Dave and have him and enter the inner lab before the doorbell cutscene. The timer for the pool is still going. If the TAS barely makes it into the lab before the Mansion has a core meltdown, then I make it by the skin of my teeth. Thankfully entering the Outer Lab is enough to disable the meltdown timer. The developers probably knew the new kid command was buggy and that it could be used for sequence breaking. They completely disabled the command once you reach the inner lab. Purple Tentacle is a capture character and so he can be frozen if a cutscene appears. By getting into the outer lab quickly, the doorbell cutscene freezes Purple Tentacle and I can enter the inner lab. I do my best to get to the next room quicly as the lag is really bad here. I'm a lot slower about getting the card key into the slot than the TAS, but I get through quickly enough. I don't get the Radiation Suit from the locker. I throw the switch quickly and boldy charge toward the meteor. Just as I'm about to get obliterated, I'm saved by the lengthy cutscene. Once it finishes, the projectile of death disappears and I grab the meteor and dash toward the garage. I get interrupted briefly by the cutscene where Ed answers the door. I have Dave open the garage and then put the meteor in the trunk and turn the key. does. This is where you issue the new kid command and switch kids before the list of kids appear. The timing on that is tricky and hard to do in real time. There aren't any major mistakes in this run, but there are a couple brief moments of hesitation.